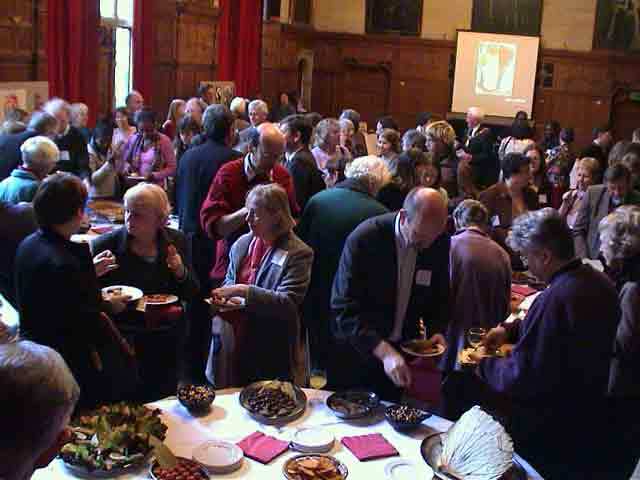 Oxford City’s Fairtrade Status was launched at a event in Oxford Town Hall on the 5th March 2004. The event, reported here on IndyMedia, included The Lord Mayor and speakers from the International Federation for Alternative Trade, Kuapa Kokoo Cocoa Cooperative (Ghana), and Oxford Brookes – the countries first Fairtrade University. Town Hall guests fell silent on Friday March 5th 2004 as a personal message from Nelson Mandela congratulating Oxford on its launch as a Fairtrade City was read out by the Lord Mayor Cllr Pat Stannard. Strong applause met his final words: “This is an important step forward. We must continue on this path, to build real opportunities and freedom for us all.” Minutes later, a samba band filled the Town Hall with music to celebrate the launch. Georgina Kwaw and Elizabeth Adjei, recorders from the Kuapa Kokoo cocoa cooperative in Ghana. Roy Scott, owner of the One Village fair-trade stores, presented a certificate from the Fairtrade Foundation to the Lord Mayor. Mr. Carlos Betancour, charge d’affaires for Uruguay, Mr.
Sophi Tranchell, managing director of Divine Chocolate Company.